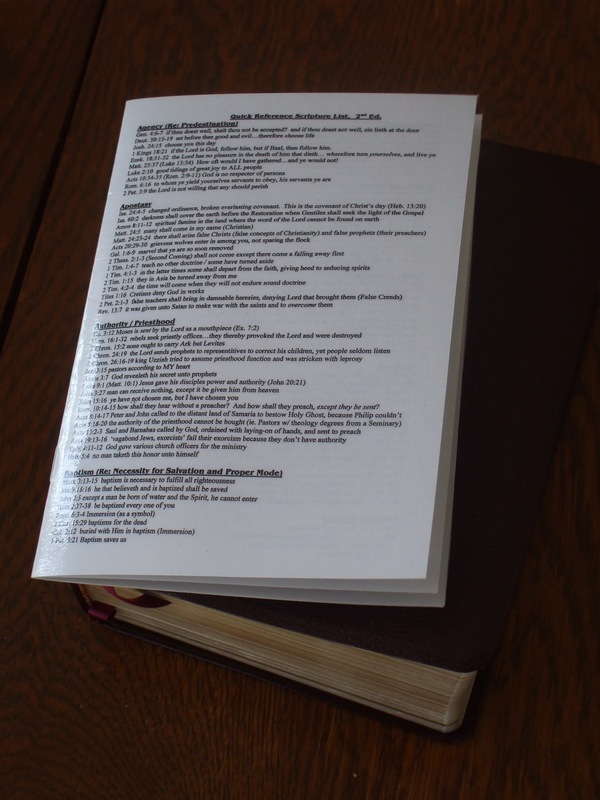 On this webpage, below this short introductory message, appears the “Quick Reference Scripture List,” which is a list of scriptures from the Bible, arranged topically and in alphabetical order for easier access. It helps to very quickly resolve concerns using the Bible (the common Christian text). I suggest that you familiarize yourself somewhat with what is on the list, so that you can react with lightning speed. 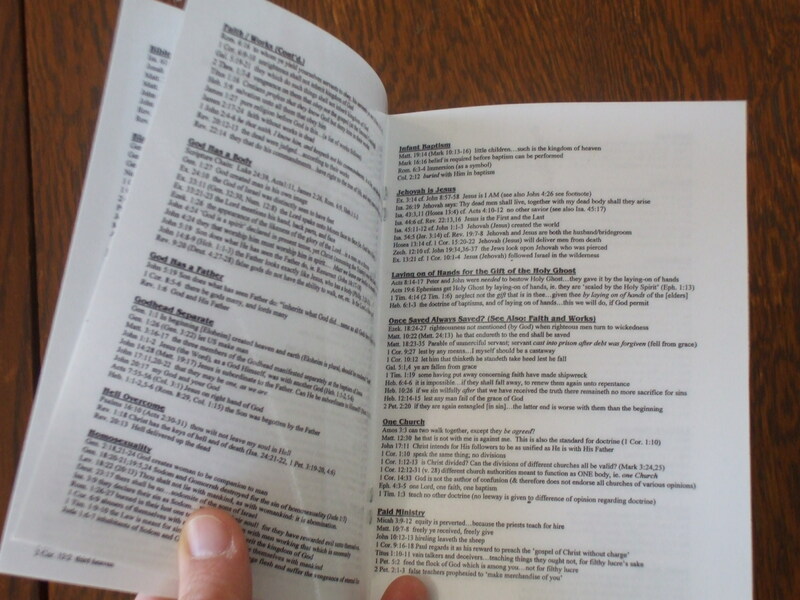 In many cases, you will prefer to use the Book of Mormon or other modern scriptures to answer questions, but in the instances where people are insisting on “proof” from the Bible, or when they are being just plain argumentative and belligerent, the Quick Reference Scripture List will give you power to humble them in a hurry. In order to have this list, courtesy of me, for your own private use, copy and paste the list into a word processor with the words in a comfortable, readable size. 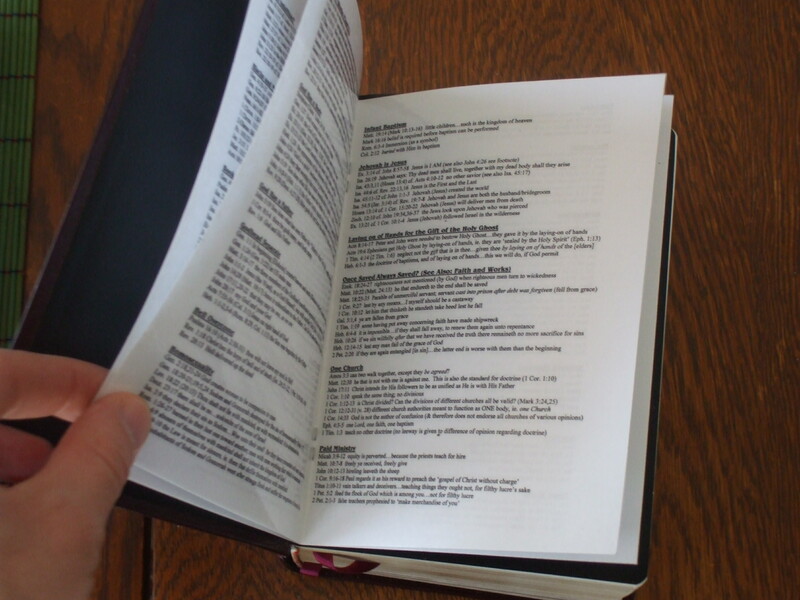 Once you have printed off the pages, take them to a photocopying store and shrink them down to a size that will fit inside the cover of your scriptures. Then I suggest laminating them and binding them with staples like a little booklet. Generally the first scripture that is listed (which in the case above would be Mark 1:9-10) is the one better suited for the particular issue at hand. So for the reference above, what you would do first is read Gen. 9:22-26, then explain that scripture if necessary, and then read Abr. 1:21-24 to clarify things or strengthen your argument. 1 Kings 18:21 if the Lord is God, follow him, but if Baal, then follow him. Matt. 23:37 (Luke 13:34) How oft would I have gathered…and ye would not! Rom. 10:14-15 how shall they hear without a preacher? And how shall they preach, except they be sent? Isa. 61:1-2 cf. Luke 4:17-19 how is that prophecy worded again? Jonah 1:17 cf. Matt. 12:40 a fish or a mammal? Matt. 2:23 where does it say that “He shall be called a Nazarene”? Matt. 27:37 cf. Luke 23:38 cf. John 19:19 just what did the title of the superscription say? John 1:18 (1 John 4:12) cf. Gen. 32:30 or Isa. 6:1,5 has no man seen God at any time? John 21:25 is the Bible the absolute complete Word of God? Rev. 22:18-19 cf. Deut. 4:2 can’t add to the Bible? Rev. 22:18-19 cf. Rev. 1:3 the prophecy of which book? John 5:46-47 If you don’t believe the Genesis account, how can you believe Christ? Faith & Works: Once Saved Always Saved? Fall of Man an Accident? John 4:24 “they that worship him must worship him in spirit…” but must we leave our bodies to worship God? Rev. 9:20 (Deut. 4:27-28) false gods do not have the ability to walk, eat, etc. Is the Lord a false god? Lev. 18:22 (20:13) Thou shalt not lie with mankind, as with womankind: it is abomination. Isa. 3:9 they declare their sin as Sodom…Woe unto their soul! for they have rewarded evil unto themselves. Joel 2:28 prior to the Second Coming the Lord will pour out his spirit, and “young men shall see visions”, etc. John 9:1-2 the man born blind; who did sin, this man, or his parents…? Testimony: How Can We Know? Can We Trust Our Feelings?